The social web has dramatically changed the way that customers communicate with organizations and how they in turn receive, manage and respond to customer service inquiries. We, at OneDesk are very excited about the two new features—help desk and online customer service—that have been integrated into our unique and complete set of applications and tools. This study conducted by ClickFox, revealed that “two in three customers would be willing to use social media for customer service if they understood the tools better.” It also highlighted the fact that online customer service is markedly more cost effective than any other customer service strategy “ such as, in person visits, phone and email. 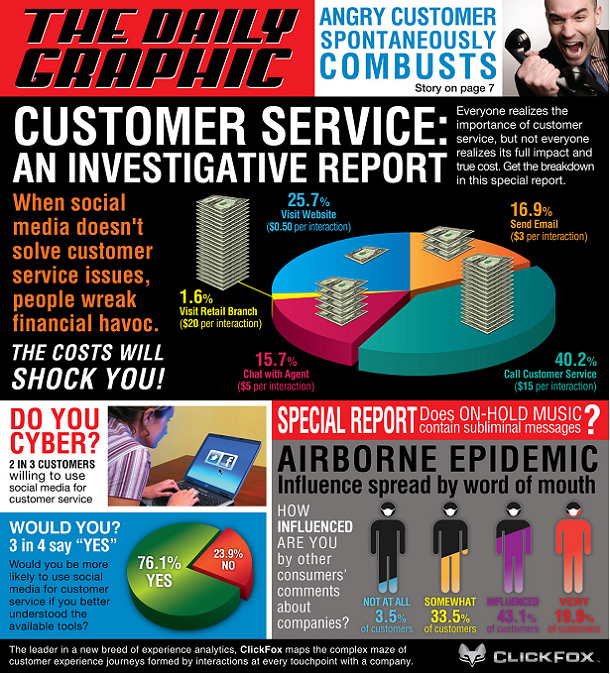 Another interesting point very well illustrated in this infograph is the idea that 44.3% of customers admitted to be highly influenced by online customer comments. That’s huge. Do you know what your customers and their friends are saying about your products and services, online right now? The need is clear: The product and service innovation process must be enhanced to include the integration of a fully functional online customer service strategy that allows you to listen to the social web, locate conversations about your products and services and respond to customer issues through that same social media channel. You can do this with OneDesk’s two new features—help desk and online customer service—that can be integrated into our full line of social media applications and tools.